Following the initial report by Smith et al., several cases were published, mostly as single case reports. Among the few case series, largest is the study of 16 cases by Gnepp et al. To best of our knowledge, 67 cases of sclerosing polycystic adenosis (SPA) are reported in English literature so far. A 17-year-old girl presented with a swelling of 1-year duration in left parotid region. Ultrasonography and fine-needle aspiration cytology studies were compatible with pleomorphic adenoma. Superficial parotidectomy was done. Gross specimen, slides, and blocks were sent for review to our center. Grossly, excised salivary gland measured 6 cm × 5 cm × 2 cm with a gray-white nodule measuring 1.5 cm × 1.5 cm. 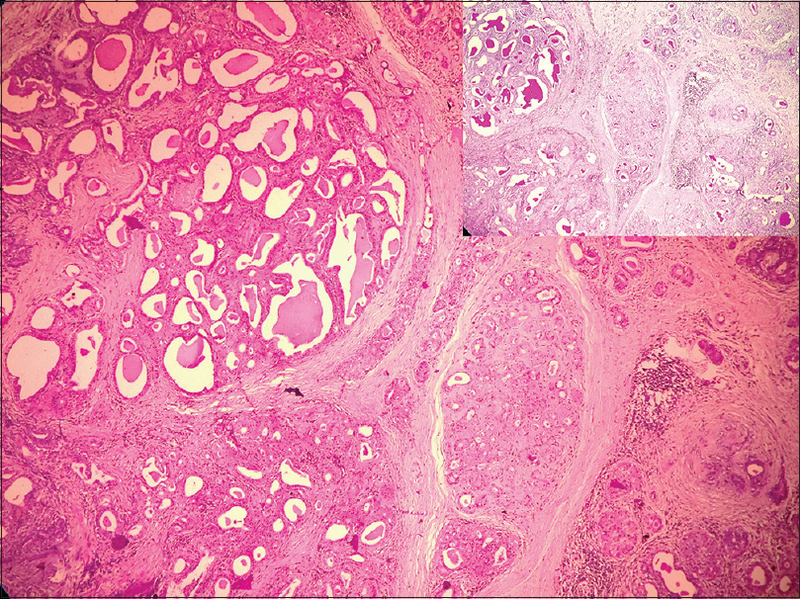 Histologically, lesion was well circumscribed and composed of lobules of variable sizes, separated by hyalinized stroma [Figure 1]. Lobules showed adenosis with closely packed ducts lined variably by oncocytic, apocrine, mucous, and foamy cells. There was focal prominent cystic dilatation of ducts and periductal sclerosis [Figure 1]. Acinar cells with zymogen granules, forming eosinophilic globules were distinct. Periodic acid–Schiff (PAS) positivity with diastase resistance was observed in latter and in ductal luminal secretions [Figure 1], Inset]. Several foci showed acinic cell hyperplasia and mild-to-moderate degree of intraductal epithelial proliferation, associated with mild atypia. Stroma showed small groups of adipocytes and perilobular lymphoplasmacytic infiltrates. Mitoses were sparse. 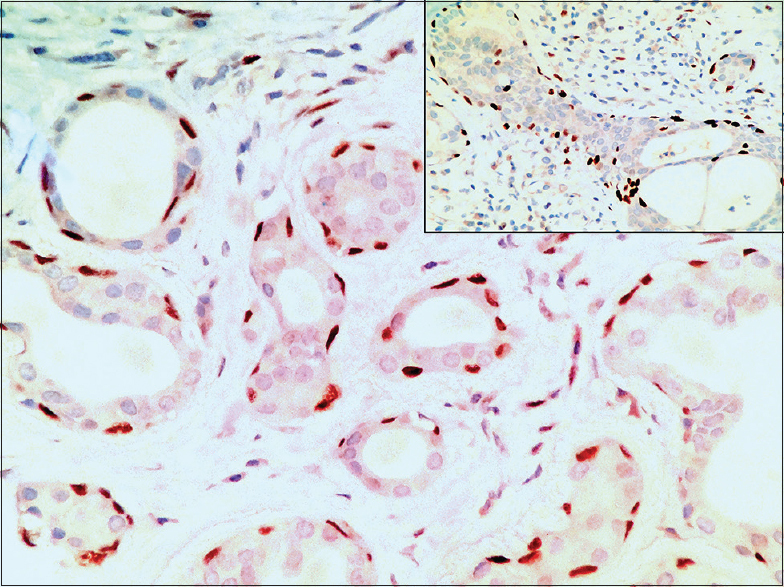 Immunohistochemistry with p63 highlighted myoepithelial layer around every duct and acinus throughout and also in foci showing epithelial hyperplasia [Figure 2]. SPA is a disease, primarily of the major salivary glands. The most commonly involved gland is parotid gland (71%), followed by submandibular glands (8%), minor salivary glands (16.1%) in oral cavity (13%) and nasal mucosa (3.2%). A case of SPA affecting lacrimal gland has been reported. Males and females are almost equally affected (male:female ratio is 1:1.15) and over a broad age range from 7 to 84 years. The size of SPA lesions ranges from 3 mm (incidental SPA) to 6 cm. A significant history was present in two cases; an exposure to facial irradiation, for acne  and lower lip lymphangioma, respectively. Follow-up data are available for 37 cases; the duration of follow-up ranged from 5 months to 40 years. Recurrent lesions occurred in five cases;,,,, the clinicopathological characteristics of which are summarized in [Table 1]. SPA is considered to have morphological resemblance to fibrocystic disease of the breast. Grossly, SPAs are well delineated, firm, multinodular, with scattered cystic structures and partially encapsulated. A distinct lobular architecture with dense sclerosis, cystic change, and adenosis, i.e., proliferation of ducts and acini, had been a consistent observation. The duct lining epithelium is cuboidal or flattened and may include apocrine, mucous, vacuolated, clear, squamous, or degenerative cells. A frequent finding is acinar cells with large globules of PAS-positive diastase-resistant zymogen granules. Stroma is often dense sclerotic with associated concentric periductal sclerosis , and occasionally cellular, with myxoid or lipomatous change ,,, and chronic inflammation.,, Epithelial hyperplasia may be seen in the form of stratified epithelium, solid, or cribriform proliferations with intraluminal bridges and papillary projections with nuclear atypia.,, Ductal carcinoma in situ (DCIS) was reported in two cases., In two of the recurrent cases, histological progression of disease was observed amounting to intraductal carcinoma in one  and to carcinoma in situ with associated invasive cancer in the other. In our case, acinic and ductal epithelial hyperplasia was seen in multiple foci, however, without any invasion. Different myoepithelial markers were employed by various investigators.,,,,,, They observed that myoepithelium was highlighted around each duct and acinus  in foci with or without mild-to-severe atypia and was discontinuous in DCIS foci. The immunoexpression was positive around small clusters and single cells in stroma in pseudoinfiltrative foci , and absent in foci of invasive carcinoma. Superficial parotidectomy is recommended for initial lesions and total parotidectomy for recurrent ones. Matsumoto et al. analyzed surgery-dependent recurrence rates and found it to be 44.4%, 7.1%, and 10% for enucleation/excision, superficial parotidectomy, and total parotidectomy, respectively. They suggest that achieving adequate margins by latter two procedures can yield a lower recurrence rate than by former but acknowledge complications associated with a radical surgery. SPA is a neoplastic disease with a tendency to recur and is associated with a low malignant potential. Herein, we report a single case of SPA, histology of which revealed all classic features described in the initial report and showed no evidence of invasive carcinoma. Our case was recently diagnosed and needs to be followed up. We wish to thank Dr. Sushma, Government Medical College, Alleppey, for providing the necessary clinical information regarding this case. Smith BC, Ellis GL, Slater LJ, Foss RD. Sclerosing polycystic adenosis of major salivary glands. A clinicopathologic analysis of nine cases. Am J Surg Pathol 1996;20:161-70. Gnepp DR, Wang LJ, Brandwein-Gensler M, Slootweg P, Gill M, Hille J, et al. Sclerosing polycystic adenosis of the salivary gland: A report of 16 cases. Am J Surg Pathol 2006;30:154-64. Pfeiffer ML, Yin VT, Bell D, Mancini R, Esmaeli B. Sclerosing polycystic adenosis of the lacrimal gland. Ophthalmology 2013;120:873-0. Canas Marques R, Félix A. Invasive carcinoma arising from sclerosing polycystic adenosis of the salivary gland. Virchows Arch 2014;464:621-5. Manojlović S, Virag M, Milenović A, Manojlović L, Salek Z, Skálová A, et al. Sclerosing polycystic adenosis of parotid gland: A unique report of two cases occurring in two sisters. Pathol Res Pract 2014;210:342-5. Su A, Bhuta SM, Berke GS, Lai CK. A unique case of sclerosing polycystic adenosis of the sinonasal tract. Hum Pathol 2013;44:1937-40. Petersson F, Tan PH, Hwang JS. Sclerosing polycystic adenosis of the parotid gland: Report of a bifocal, paucicystic variant with ductal carcinoma in situ and pronounced stromal distortion mimicking invasive carcinoma. Head Neck Pathol 2011;5:188-92. Skálová A, Gnepp DR, Simpson RH, Lewis JE, Janssen D, Sima R, et al. Clonal nature of sclerosing polycystic adenosis of salivary glands demonstrated by using the polymorphism of the human androgen receptor (HUMARA) locus as a marker. Am J Surg Pathol 2006;30:939-44. Mackle T, Mulligan AM, Dervan PA, O'Dwyer T. Sclerosing polycystic sialadenopathy: A rare cause of recurrent tumor of the parotid gland. Arch Otolaryngol Head Neck Surg 2004;130:357-60. Matsumoto NM, Umezawa H, Ohashi R, Peng WX, Naito Z, Ogawa R, et al. Surgical treatment of rare sclerosing polycystic adenosis of the deep parotid gland. Plast Reconstr Surg Glob Open 2016;4:e645.